Gold Coast are locks to finish with the spoon (or at best bottom 2). There were immediate issues with both predictions, although this piece only looks at the latter. And after three weeks, neither looks likely to come to fruition. This isn’t the first year that the Suns have looked good early in the season, and a particularly soft starting draw had the potential to flatter them early. But there’s some real optimism about Gold Coast’s start, and what it might mean for the future. HPN have identified, both here and on the ABC, that the AFL is increasingly becoming turnover driven in seeking sources for scores, at the expense of clearances. Turnovers have risen year on year, and no side has leant harder into this trend this year than the Suns. No side has a bigger intercept differential than the Suns do this year; likewise, no side has a worse clearance differential. This is a carbon copy of what the Tigers played like last year – let the opposition get the ball first, and take the ball away to use it last. The Suns have built the foundations of this on a radically new defensive set-up – one that may have surprised many going into the season. The Suns knew that they would be without former co-captain Steven May heading into the season, but it would have been less expected that they would also be missing the long term cornerstone of their defence in Rory Thompson (via an ACL injury). Thompson has flown under the radar a little in recent years, but the two meter tall defender has consistently been a spoiling beast, allowing May and others to float off and intercept the plethora of loose kicks that the Suns have faced over the years. In their stead, the Suns have relied upon two well-recycled players and a 19-year-old third round draft pick converted from an outside midfielder, as the base of the most effective defence so far this year. Jack Hombsch, the most-travelled player in league history, has done what he does – fill defensive gaps at understocked clubs. While he lacks size on someone like Thompson, he has filled those shoes effectively so far, and has also doubled as the marshal of the defence. While it was expected that Hombsch would be immediately serviceable for Gold Coast, his early performance is probably the finest of his career (or maybe in line with his early days at the Giants). His spot is the one threatened by the development of Ben King, or the return of Thompson next year, but right now he is doing more than enough. Sam Collins, delisted by Fremantle in 2017 before putting in an outstanding VFL season for Werribee, sits 5th in the league for contested marks per game and 12th for intercepts per game. Collins ate up all the loose aerial ball last year for the Tigers, punishing any opposition that put ball in his vague vicinity. There was some faith that his stellar VFL form would translate back to the AFL, but fringe All-Australian consideration was perhaps a bridge too far for even the keenest Collins fan. He is almost doubling his previous career bests for intercepts and contested marks, and has lost just 1 of his 12 contested defensive one on ones so far. The third component of their tall defence, Charlie Ballard, is perhaps the most surprising. A very late riser in 2017 draft considerations, Ballard was picked up as a tall utility that hadn’t really found a solid position, nor had one projected for his future. His height suggested one day he would evolve into a key position player, while his speed, tank and ability to read the play suggested that he would become an outside midfielder as he developed. At this stage, the former seems more likely for his progression, as he is tied for with Collins for being 12th in the league for intercept marks. He has surprised most with his ability to slide across and cut off opposition forays up forward. Right now, he is looking like a prototypical intercept defender – but one that can cover almost any opposition forward at a pinch. The rest of the Gold Coast backline has been very solid to great so far as well. After a year shifting between the midfield and defence, the emergence of the rest of the Suns has meant that Lachie Weller has been able to spend more time down back – a role he is more suited to. Coming off the Suns B&F last year, expectations were already high for Jarrod Harbrow (one of only two Inaugural 22 Suns still at the club), but the emergence of the other three has elevated his play this year. And we haven’t even started talking about Jesse Joyce or Pearce Hanley; both near afterthoughts in the AFL landscape. A bunch of those guys (bar perhaps Harbrow and Weller) are big enough to switch onto taller forwards for at least specific possessions, and most (perhaps bar Collins) are quick enough to keep up with most forwards. In an age of defensive flexibility, the Suns have stumbled upon one of the more flexible setups in the league right now. And, thanks to the experience of Hombsch and Harbrow, the communication down back has let them use this flexibility. None of this was expected – almost every footy mind thought that the absence of May and Thompson would mean that the Suns would resemble a sieve down back. And, given the season is young and opposition so far middling, they still may do so by the end of the season. But for now, the Suns are making it work. Logan native Alex Sexton has become the somewhat unexpected centrepiece of the post-Lynch forward line. He’s currently equal second in the Coleman race with 10 goals from 3 games. Sexton has become a very dangerous mid-sized player. When he gets the ball he tends to do damage – he is sitting tenth in the league for points scored per disposal. On this measure he sits near players like Jordan de Goey and Charlie Cameron. A big part of why Sexton is able to flourish is the mismatches he can exploit. At 186cm, he’s a quick mid-sized player, but he can’t generally be covered by a larger player because there are three contrasting tall players drawing focus. Most obvious is the hulking figure of Peter Wright, who at two metres tall generally has size on any defender and is quick for his weight class. Chris Burgess, a 23-year-old from West Adelaide, has demonstrated that he is a marking threat as well. Last year’s number two draft pick Jack Lukosius is raw and slight, but he’s still 196cm and using his surprising speed across the ground to make up for his relatively slight frame. Those three demand tall defenders – even the raw Lukosius – given their size and ability above their head. That means that Sexton is often matched against the fourth taller defender (at best), and Sexton’s ability to read the flight of the ball and use of subtle body work gives him an advantage in those matchups. When Sexton is closer to goal, or the defence takes a gamble, a more true KPD is sometimes matched up against him, where he can burn the defence with his speed. Along with Petracca, Dangerfield and Martin’s stints up forward, Sexton has become a horror matchup for most opponents. Then there’s Jack Martin. Martin’s uncharacteristic inaccuracy (2 goals 8 behind, admittedly from a fair few flying shots) is the only reason we’re not talking about him alongside Sexton as a front half weapon. Martin is in career best form in just about every statistic. He’s playing a bit more of a midfield role than Sexton. His 5.33 inside 50s per game is more than double any previous season, is managing 22 touches a game (also a career best), with 2.67 clearances a game to boot. Martin’s tackle count isn’t quite as high as last year, but it’s probably just because the Suns are controlling the ball more. He’s also taken 5 contested marks in three games, and must have flown for twice as many more. All in all, there’s suddenly a number of weapons available to a Suns team who seriously struggled to score last year. One notable feature is the spread of marking so far. No Suns player is near the top of the league in the marking categories, but they have had four players take 5 marks inside 50 and average at least one mark inside 50 per game (Martin, Burgess, Swallow, Sexton). This ignores Wright clunking 3 while often working further up ground as an escape target from defence. These are very early days against some poor opposition defences, but it looks like a spread of targets only a handful of sides (roughly: Collingwood, West Coast, Port Adelaide, and Brisbane) can match. After three years at the Suns, Rodney Eade was sacked from the Suns towards the end of 2017, and replaced by Stuart Dew, a long term assistant at the Swans (and former Port Adelaide and Hawthorn player before that). It’s fair to say the Dew era is fairly visibly different from previous iterations of the Suns. Went from a team who handballed much more than they kicked to a side who preferred kicking over handballing more than any other team except West Coast. Saw their tackle count go from the lowest in the league to nearly the highest. Went from a side who both took and allowed a lot of uncontested kicks per mark, to a side that took and allowed far fewer. Saw the contested possession share of their total touches go from nearly the lowest to nearly the highest. These were style indicators, and the Suns still only won four games, but this all illustrates a team that was under strong coaching direction to change how they played. They started going long and direct, and sought to apply a lot of pressure to individual possessions. The high intercepts count and their marking power we see this year are probably direct outgrowths of the building blocks set by the stylistic shift of last year. Last year, they continued having a hugely negative turnover differential. So far in 2019, they’ve turned that aspect around and are currently the team with the best turnover differential in the league. The Suns have seemingly committed to a similar “run and gun” style when they get the ball, looking to move the ball fast like their Sunshine State counterparts Brisbane, but perhaps going even faster. Sometimes the Lions hold up play behind the middle of the ground, switching the ball while waiting for holes in the shifting opposition defence before exploiting gaps and mismatches. The Suns haven’t shown that patience as yet, perhaps figuring a turnover down the ground is just another counter-intercept waiting to happen. Last year, the Suns largely still looked, personnel-wise, like they had under Eade. Dew had barely arrived when trade period started, and list manager Scott Clayton departed after the trade period, dubiously sending a lopsided swap of second round picks to the Eagles before moving there himself. The trade period was relatively light on in new players for the Suns – they lost Ablett, Saad and Matera and brought in Lachie Weller for a high draft pick, then got Harrison Wigg and Aaron Young cheaply. The 2018 off-season was thus the first chance Dew and new list manager Craig Cameron (fresh from GWS) had to really shape the list. And reshape it they did. 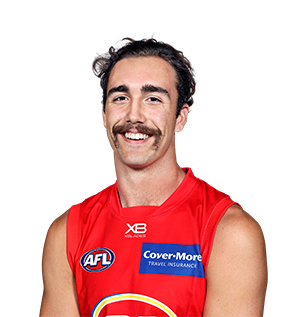 The Suns shed a number of players – Steven May, Tom Lynch, Jack Scrimshaw, Kade Kolodjashnij, Jarryd Lyons, and Aaron Hall to other clubs. The loss of Lynch, May and Kolodjashnij netted value, but the rest of these players went for little or nothing in return, looking like salary cap dumps or the turfing of players who didn’t fit plans any more. The 2018 trade period was a major list overhaul. Broadly, gold coast acquired a group of eight 20 to 26 year olds who were fringe players at good clubs, or standout state league players. At the very least, bringing in a group like this should have made Gold Coast scrappy and competitive, and it seems to have done so. From established teams they got Anthony Miles, George Horlin-Smith, Corey Ellis, Jordan Murdoch and Jack Hombsch. From the mature age pre-list concessionary rule, they took Sam Collins, Chris Burgess and Josh Corbett and kept them rather than trading them (unlike Carlton). All these eight players bar the injured Ellis and Corbett played round 1. That’s a quarter of a new side, enough to completely change its complexion, and have flow on effects like bringing Sexton and Martin to career best levels and providing better support and leadership for the developing drafted talent. Essentially, Gold Coast recruited a “middle class” in one off-season. The recent drafts have also been good to the Suns. Loaded with picks in many of the drafts, they’ve netted enough AFL quality players to develop a solid core for the future. Over a third of their current team is just a product of this development. The last four draft classes were all represented in the Suns round 3 team – Brayden Fiorini, Darcy MacPherson and Jesse Joyce from 2015, Jack Bowes from 2016, Wil Powell, Charlie Ballard and the mature age Nick Holman from 2017 and Jack Lukosius from 2018. There’s some selection pressure on these players too, not always something the Suns have had. HPN watched the Suns NEAFL side play last weekend, and they had Sam Day and (HPN’s new favourite player) Brayden “Goober” Crossley looking like effective talls, Will Brodie dominating through the middle (remember, at NEAFL level), with Aaron Young and Michael Rischitelli certainly showing that they are proven solid senior players. There’s options should the Suns want to drop someone. The final group of 2019 Suns players are the old hands, including foundation players like Swallow and Harbrow, early draftees like Miller, Martin and Sexton, and pre-2018 recruits like Witts, Hanley and Weller. Hanley and Harbrow are 30 and the rest are, like the remainder of the Suns team, 27 years old or younger. The old hands form most of the leadership group, and given the list turnover, poor off-field facilities and onfield struggles at the club they must at this stage be a pretty hardy and seasoned group. They’ve likely been judged a good core to build around, helping the draftees to develop, supported by the “middle class” of solid 20-something recycled players. So far, the mix is looking pretty promising, and enough to pull the Suns out of the bottom reaches of the ladder. Where they project this year is now hard to say, which is a win already. It is still unlikely that they will make finals, but a wooden spoon finish looks even less likely. And even if the Suns don’t keep up the winning record, they should have most of their current group for a few years and look like they now have a viable development plan. They’re building a modern game style built around a flexible intercepting defence, forcing turnovers, and a multi-pronged forward structure. “Good” is a hard thing to judge, especially after three weeks of footy, but the signs are looking promising – especially for the long haul. For the first time in a long while, the Suns may have a promising future ahead. Previous Post:How much money did the AFL give your club in 2018? Great read and analysis cheers.